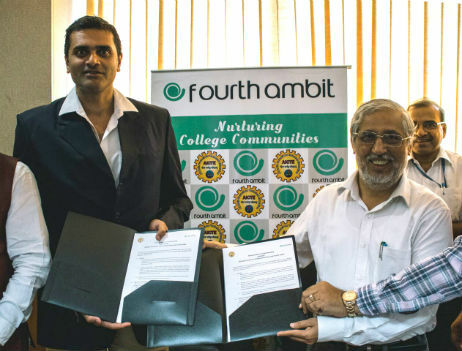 New Delhi: The All India Council for Technical Education (AICTE) has signed a Memorandum of Understanding with Edu-Tech Startup, Fourth Ambit Technologies Pvt Ltd. As part of this MOU, Fourth Ambit would work with AICTE and its member institutions to leverage its online platform and technical infrastructure to setup private online community portals for AICTE approved institutions. Such a community portal would help these institutions to on-board and engage alumni, parents, corporate partners and other well-wishers, thereby facilitating value for their students and faculty. In addition to the above, a supporting ecosystem would be set up at the Fourth Ambit platform level by on-boarding partners across themes like skilling, entrepreneurship, networking, jobs, internships, faculty capability building, higher education, social causes, and technology evangelism. The MoU was signed by AICTE Chairman Prof. Anil D Sahasrabudhe and Fourth Ambit CEO Rahul Das at AICTE office in VasantKunj, New Delhi. “Setting up online community portals for more than 10,000 technical institutions across the length and breadth of India and fostering multi-dimensional value for more than 50 Million users is a daunting task. But, backed by a robust tech platform, led by an inspired team, supported by corporate partners, enabled by AICTE and State Universities, we are confident of creating history and nurturing a self-fulfilling value-based ecosystem”, remarked Rahul Das, CEO of Fourth Ambit. The project would be activated in a phased manner across the various states with the AICTE Regional Office and State Universities playing a key role in the roll out. Corporate partners would get an opportunity to engage with and create value for a large base of authenticated students and alumni from technical institutes across the country.